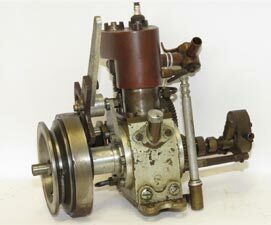 The Stuart Turner AE shown here could well be into its second century as they were being produced from around 1910-1912, intended for model aircraft in air cooled form and for boats with a pressed on water jacket. 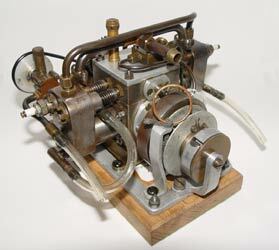 The motor was available in four versions, two single cylinder and two horizontal twins. Each featured atmospheric induction through an automatic inlet valve, with the exhaust valve operated by the single cam. What makes this example exciting is that it still has an original Stuart 'spray carburetter' fitted, one of the very earliest float controlled devices to be used. Despite its size, the motor is relatively light, weighing 4-1/2 lbs with the flywheel and extra 1-1/2 lbs. 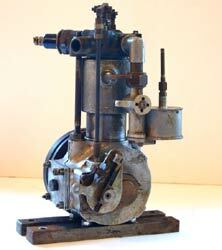 This is the 30cc A Class hydro motor built by Richard Dalby's father. At first glance this does show some similarities with the Atom V but the whole design is far more technically sophisticated and more compact. The rear housing for the motor does seem to have been derived from a casting, again with the shaft extension for the magneto, which is provided with a mount rather than attaching directly to the motor. Both motors are fitted with clearly graduated needle valve and stranglers to aid starting. The combination of plate mounting for the engine at the rear and bridge at the front is also unusual and we wonder if there might have been conventional lugs at some stage? Two lovely and evocative motors and thanks to Richard for sharing them with us. As Arthur Negus was wont to say, although these ones are not identical. This lovely 15cc 'B Class hydroplane motor is the first of two that we will be featuring built by engine specialist Richard Dalby's father. Richard had told us about them some time ago, but it was not until earlier this year that he managed to dig them out for us. Both motors have rear rotary valve induction with a shaft extension to drive the most unusual tubular magneto. Even more intriguing is that the crankcases are all hewn from solid aluminium which must have been a major undertaking. 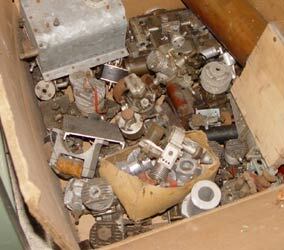 We have yet to identify the boats that these motors were in but that is work in progress. 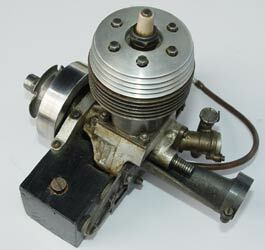 This all fabricated horizontal, side valve twin was built by the younger of the Arkell Brothers as a successor to the single cylinder motor below. The motor was also run in Moraima III, using a similar evaporative induction system. Clearly seen on the front of the motor is an ingenious recoil starter that utilises the mainspring from a clock, and still works perfectly. Like the single cylinder motor, water cooling is via a pump, this time driven by belt from the crankshaft, rather than directly coupled to it. 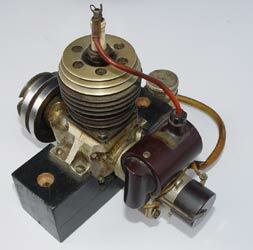 The construction of the motor was fully described in Model Engineer during 1943. Arkell and 'Moraima' were featured on the cover of Model Engineer in August 1943. 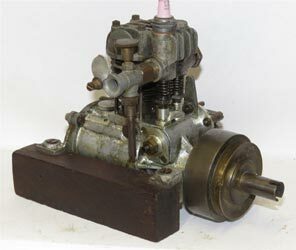 This 6cc, single cylinder, side valve motor links to the very earliest days of the use of IC engines in racing boats, as it was built by F G Arkell, who, along with his brother were pioneers in this field. This motor was originally fitted in 'Moraima III', a successor to their boat which won the inaugural Model Speedboat Competition in 1908. The motor was designed to be completely fabricated from stock materials and featured a hand starting device, seen on the left. Although both valves were cam operated, the intake still relied on surface evaporation of the fuel. In the series of constructional articles for the ME 24" hydroplane published during 1939 the prototype test hull is shown fitted with this very engine. At just 5cc this side valve four stroke motor would have been marginal on power, even for this sized hull. The engine was designed around 1938 as a four-stroke alternative to the Kestrel, with the same radial mount and crankcase extension forming the tank. Westbury came up with an ingenious set of engine mounts to allow it to be mounted on conventional engine bearers. In his articles he comments on the engine's ease of handling, rather than its power and said that he always had it in his office fitted with a prop so he could flick it into life to impress visitors. This 'teaser' is just part of what was discovered during our favourite activity, rooting about in a garage and something of a shock as we were unaware of the existence of any of it. The keen observer may be able to work out the origins of this amazing discovery, but suffice to say, it is probably one of the most important finds to have come to light. The provenance of the material is impeccable and it is all currently being recorded and catalogued. In the June edition of OTW the full story of the discovery and extent of the collection will be revealed. At around 2cc, the 5/16th X 24tpi plug dwarfs this tiny motor. The distinctive twin exhausts either side of the venturi and needle valve and split crankcase should make this engine easily identifiable. Cylinder head & hold down threads are 8 & 6BA. Needle is 8BA. Split crankcase screws are 3/32" x 48tpi (BSW). 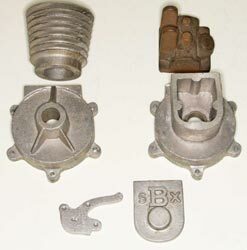 The castings are extremely precise & accurate & it's hard to see the vertical crankcase split join line. The engine is very well made, professionally(?) with excellent internal fits & good compression. Any clues please? The photos do not do justice to the superb workmanship on the 'new build' Bonds Simplex. 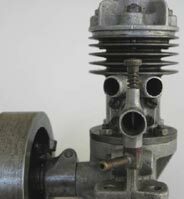 From around 1931, this motor was a staple in the Bonds engineering catalogue and odd castings were still lurking on a visit to their premises in the late 60s. 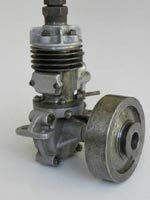 There is a resurgence of interest in these older motors and castings are now available for many early designs. It is a pleasure to be able to feature a modern rendition of this old favourite. 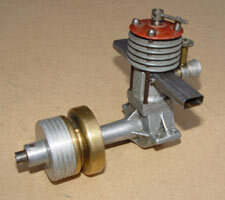 Prize winning flash steam motor. Built by a prolific model engineer from the York Society, W. Shearman, this horizontal twin had poppet inlet and exhaust valves, as well as uniflow exhaust ports. It was built in 1936 and displayed at the 1938 ME Exhibition where it won a certificate of merit. 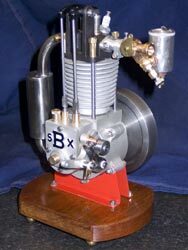 In 1938, the engine also won a competition, sponsored by John French, for innovation in the design and execution of the pumps, so important on a flash steam motor. 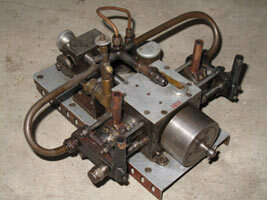 Edgar Westbury used the motor in articles to illustrate various flash steam design features.